Front and back porches flank the spacious great room of this spectacular three-bedroom home, and with its rear entry garage, it's even lean enough for narrow lots. 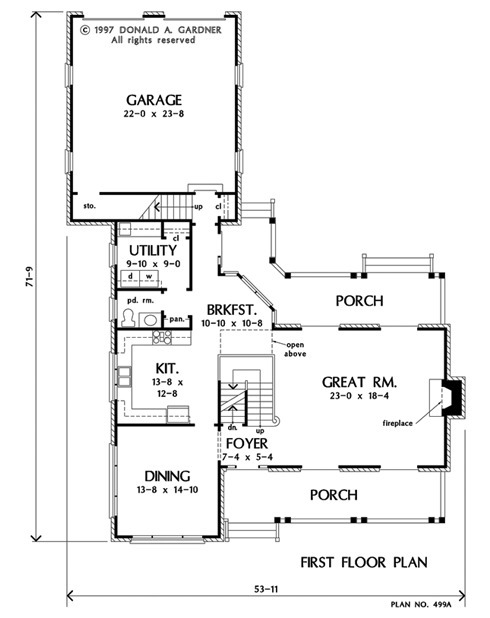 The large U-shaped kitchen efficiently serves the dining room on one side and breakfast bay on the other, with a pantry, half bath, and an impressive utility room nearby. A rear staircase accesses the bonus room over the garage. A cozy window seat awaits at the top of the main stairs. To one side is the master suite, distinguished by a tray ceiling and a splendid private bath with walk-in closet. 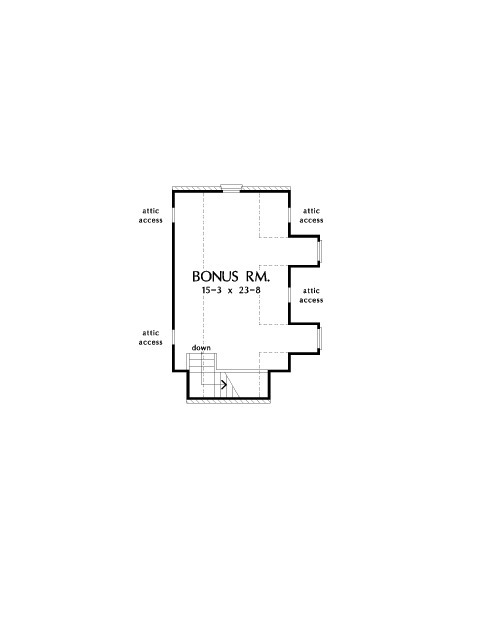 To the other side are two bedrooms that share a hall bath and linen closet. 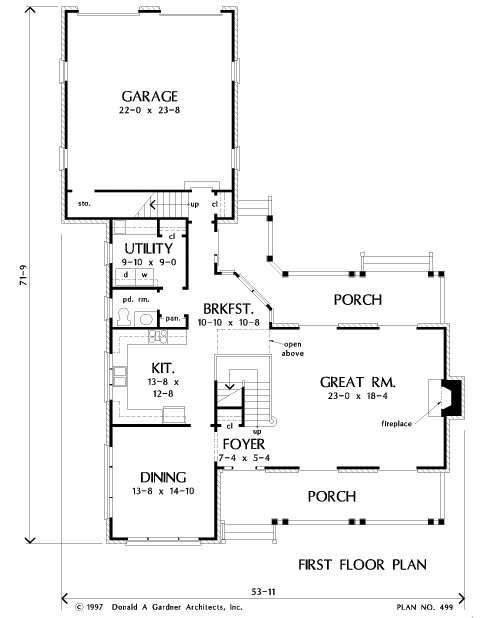 2nd Floor: 1054 Sq. Ft.
1st Floor: 1347 Sq. 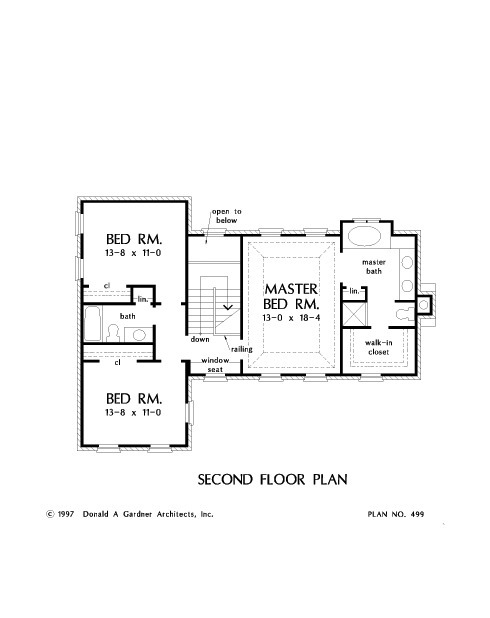 Ft.
House Dimensions: 53' 11" x 71' 9"
Great Room: 23' 0" x 18' 4"
Master Bedroom: 13' 0" x 18' 4"
Foyer : 7' 4" x 5' 4" x 9' 0"
Dining Room : 13' 8" x 14' 10" x 9' 0"
Great Room : 23' 0" x 18' 4" x 9' 0"
Kitchen : 13' 8" x 12' 8" x 9' 0"
Breakfast Room : 10' 10" x 10' 8" x 9' 0"
Utility Room : 9' 10" x 9' 0" x 9' 0"
Bonus Room (Vaulted): 15' 3" x 23' 8" x 9' 0"
Master Bedroom (Tray): 13' 0" x 18' 4" x 10' 6"
Bedroom #2 : 13' 8" x 11' 0" x 9' 0"
Bedroom #3 : 13' 8" x 11' 0" x 9' 0"
Porch - Front : 30' 0" x 7' 0" x 0' 0"
Porch - Rear : 23' 0" x 7' 0" x 0' 0"